I just got this new Stampin’ Up! 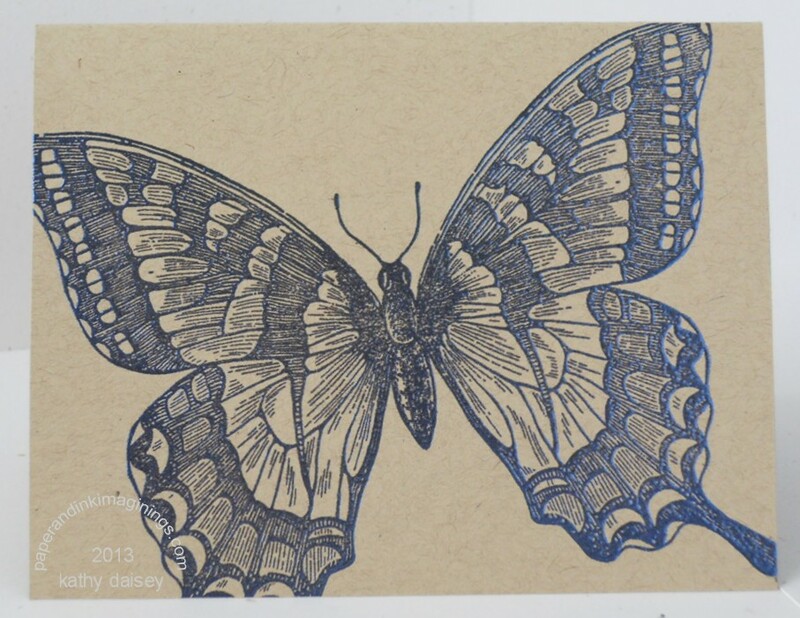 butterfly stamp a few weeks ago. It is HUGE – it fills the front of a 4.25 x 5.5 inch card. I decided that it needed to be iridescent, so I pulled out my collection of Pearl Ex pigments. I used the Duo Red-Blue, which appears blue on lighter colored card stock, but pink on darker colored card stock. I mixed the Pearl Ex with clear embossing powder and heat embossed the butterfly. The embossing powder seals in the Pearl Ex so it does not rub off. Supplies: Stamp – Stampin’ Up!, Paper – Papertrey Ink Kraft, Ink – VersaFine Onyx Black, Red/Blue Pearl-Ex duo, clear embossing powder. Categories: card, note | Tags: pearl ex, Stampin' Up! | Permalink. Congratulations on your new endeavor. I will sign up to enjoy your entries, however, I will still purchase my cards directly from the source! Thanks, Terry! This is really just a way to showcase my work, no store here. I may branch into Etsy. Of course you can contact me privately if you are looking for something specific.